Look at this thoughtful chap. 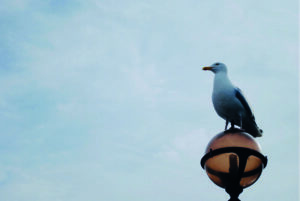 He’s perched on a lamp post on Llandudno pier, gazing out to sea. Down below, fat tourists wander around with sticky donuts and runny ice cream, but from his vantage point, the sound of waddling morons dies away. He hears the wind whipping at his sleek feathers and the call of the other gulls circling above. He sees the sun glimmering from the rolling peaks of the slate grey Irish Sea. He is deep in existential contemplation. The question is, what is he contemplating? That important question is not just about probing the philosophical leanings of a Welsh sea bird. It’s also your route to a big, big prize, which may or may not be fish-based. 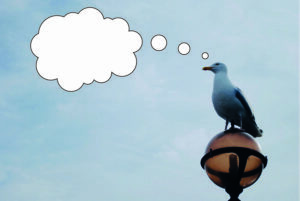 If you think you know the answer, and you’d like to be in with a chance of winning the Luxury Mystery Prize that might have been selected by a seagull, then leave your answer, answers or both in the comments below. As the seagull himself would say: squawk! Categories: Competition, Lumpy and/or mysterious, OWLS! I will also be accepting that question as your first entry. What languages are acceptable for entries? Is the seagull sat on an orb and if it is an orb what is the orb’s name? Kev: any language you think a Welsh seagull could reasonably have learned. Your question has been entered into the competition as your first entry. Ian: that doesn’t strike me as something the seagull might be thinking, but sure, that’s your second entry. Is the orb making the seagull think strange thoughts? That’s your third entry. I have to say I’m intrigued that you seem so sure the seagull is sitting up there thinking about itself in the third person, and I’m not sure what the judges will make of it, but I suppose the competition is yours to play as you see fit. Okay, I think I have the rules down now. In that I understand what the rules are and my next entry will be the winning one. Excellent. I’m looking forward to it. In the meantime, that lengthy statement has been accepted as your fourth entry in this competition. Kev’s going to have to pull his finger out if he’s not going to be totally outnumbered by McIvers. Damn, I meant to submit one more before the clanger but I’m too late. When do we find out who’s won? Do we get the prize this weekend? Do I get bonus points for drawing a picture of your slippers? You didn’t draw a picture of my slippers, so I don’t see how you qualify for any bonus points. You’re right. I failed. All that time and not once did I p-p-p-p-p-p draw your slippers. Yeah. Not once. I have a special place on my bedroom wall reserved for a neatly mounted and framed portrait of my slippers, and now I have nothing to hang there. You can barely even begin to imagine the level of chafing that my chagrin has suffered. I’ve had to get a special cream for it.